First Line: Thumb out, shoulders hunched against the wet Phoenix night, eighteen-year-old Jonah King stood at the curb trying to catch drivers' eyes as they stopped for the light. Private investigator Lena Jones is running a surveillance job in an industrial section of Scottsdale when she hears suspicious noises outside the compound. Checking to see what's going on, Jones not only finds a body dump, but she knows the victim-- a member of Second Zion, a polygamy cult based in northern Arizona. With the help of a former "sister wife" Lena searches for the killer and learns what happens to all the unwanted male children of polygamy. 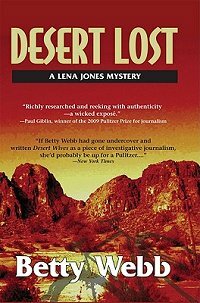 This is the second Lena Jones mystery to be centered around the topic of polygamy, with Desert Wives being the first. It is obvious that Webb feels very deeply about the subject as she skillfully weaves the sickening facts about the practice throughout the story. Just as interesting as the plot line involving polygamy is the plot line which has Lena's favorite foster parent coming for a visit. Lena's traumatic childhood plays a large role in each book. She's a complicated woman that I've come to care a great deal about, and although you can read Desert Lost without becoming confused, I would recommend that you read the books in this series in order as Lena learns to come to grips with past tragedies. If you're in the mood for well-plotted mysteries that keep you guessing, that give you a true picture of present-day Phoenix and Scottsdale, and that give you complex characters that you can sink your teeth into, I welcome you to the world of Lena Jones. Cathy - Thanks :-). I have to confess I haven't read any of the Lena Jones stories yet; time for me to get cracking on that!! I love the Lena Jones series. Lena is a great character. So interesting. Betty Webb did a call-in to my mystery group when we read this one. She had a lot to say about her research and writing of DESERT WIVES. Margot-- Oooh, I think you'd love Lena! Kay-- I would imagine she did. It's a subject that's very close to her heart. She writes about it truthfully and with great emotion. I haven't read any books in this series yet either, but it sure sounds good! Kris-- It is very good!